Nowadays, air conditioning is a vital feature of any home, specially for areas where the sun is always beating down and raising everything well over 80 degrees. Most of these residential homes have at least one air conditioner installed in a room, and most end up having some kind of central air conditioner that does the job for the entire home. However, because these machines work so hard to keep your home at a stable temperature, they are prone to breaking and needing regular maintenance, if not repairs. That’s when you need to call in Charlotte AC repair services. Your air conditioner is an important part of leading a comfortable lifestyle, and we understand how important it is for you to be able to go about your day following the regular routine, rather than turning up all the fans in an attempt to cool the room down. 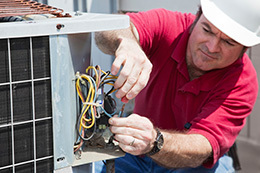 Charlotte AC repair companies know that in order for everything to work smoothly, your central heating and air units need to be in working order. Though to some, having a working unit may be considered a luxury, for many of us it’s just a normal way of life that can affect our mood and productivity if it’s removed. This is true for many commercial and office buildings – a working central air system is vital to the business’s well-being, specially in the summer when employees get antsy if the temperature is a bit too high. With all the stress that these machines tend to get put through, it’s no doubt that sooner or later, little parts start to break and sometimes you just have no idea how to fix it and get it working again. Charlotte AC repair services are always happy to help in these situations, because they know how important having a comfortable space is to you, your employees, and your mood. Don’t let the heat beat out your productivity.